Written by: Laila I N.
This is an American film which adopted a background of a jungle in India¹. It is directed by Jon Favreau (the director of Zathura, and Iron Man) and produced by Brigham Taylor. Genre of the film is family, fantasy, and adventure with duration of 110 minutes. As the output of Walt Disney Pictures collaboration with Fairview Entertainment and Moving Picture Company (MPC), it was released on 15th of April, 2016². 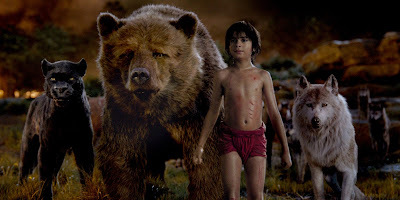 The film begins with a scene where Mowgli (the man cub) is running and jumping with a wolf-fold in a lead of a black panther called Bagheera (voiced by Ben Kingsley). 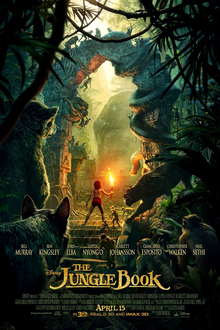 Overall, this film narrates about Mowgli’s life adventure to survive from the threat of a malicious tiger Shere Khan, which is voiced by Idris Elba. Shere Khan exceedingly hates Mowgli because of his background life in the past. Therefore, Shere Khan threatens Mowgli to leave the jungle eternally or he will kill him. Also, he notices all inhabitants of the jungle that whoever protects Mowgli, will be killed too. In the middle of his journey, Mowgli gets a lot of experience, until he meets his new friend, a sloth amusing bear called Baloo (voiced by Bill Murray). This film has several strengths. Those are from the visual effect aspect, the voice cast aspect, and the magical power aspect. Firstly, the visual effect of this film is looking extremely realistic. By looking at the way of the character’s move and talking, it makes us forget that it is just computer scenes anyway. Personally, I am in surprise when I saw the appearance of King Louie, a Gigantopithecus (voiced by Christoper Walken). He seems like a real creature. Secondly, the strength of this film is the voice casts’ perfectionist. They succeed not only acting to voice the characters, they also performing to sing with their own way. As songs The Bare Necessities, sang by the bear together with Mowgli and I Wanna Be Like You, sang by King Louie. Lastly, there are two magical powers that we can learn from it. Firstly, do not be afraid of the bad master. For justice, let’s together we go against him bravely even though we are weak. This lesson is pouring in the law of the jungle’s propaganda which declared ‘…For the strength of the pack is the wolf; and the strength of the wolf is the pack….’. Secondly, just be yourself as whom you are. As Mowgli is a part of wolf family, they ban him from doing his ‘tricks’ at first. But then, they admit him to act like human’s do. However, this film has a weakness which it is so scary for children. There is a tense scene where Mowgli was winded by the mesmerist python (voiced by Scarlett Johansson). Possibly it will frighten them when they watch it because they will imagine themselves as to be Mowgli. So, parents better to go with them for watching together. Overall, The Jungle Book is a good film and worthy to be enjoyed together with families or friends; accompanied by such drinks and snacks for more fun. Saya masih sedang belajar mengelola blog. Isi dari blog ini bermacam-macam; dari contoh teks Bahasa Inggris, berbagi tips, ngomongin film/isu-isu, puisi, sampai curcol. Ada yang merupakan hasil tulisan saya, ada juga yang merupakan tulisan rekan (Lihat Label Kreasi Rekan). Short Descriptive Text About Ria Ricis. Copyright © 2017 - Ummu Imro'atus Sholihah. Simple theme. Powered by Blogger.